We offer Outer Banks Charter Fishing excursions anywhere on any type of boat - it just depends on what you want to do. At Outer Banks Charter Fishing and Corolla Bait & Tackle, you can go offshore, inshore, back country, or relax with the whole family to fish and crab aboard our leisurely designed 25-foot pontoon boat in the Currituck Sound. If you do not have a full party, let us arrange a make-up charter. Or, if you prefer keeping your feet on land, we conduct Surf Fishing Classes, & we also have Rod & Reel Rentals & Crab Pot Rentals. We have fresh quality bait and crabbing supplies, and offer free fishing/crabbing instruction. 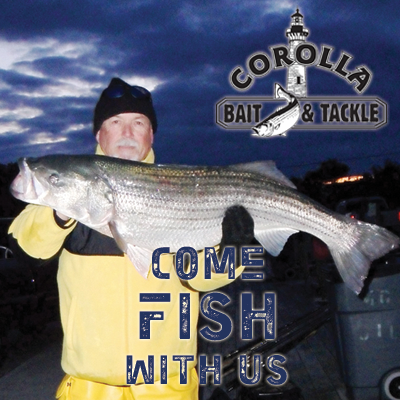 Give us a call or send an email to gofish@corollabaitandtackle.com - we’ll be happy to make your vacation full of fishing memories!! We strive to maintain superior customer service to ensure you have a memorable fishing experience. Our mission is to go beyond providing the necessary equipment and supplies for your fishing pleasures, because we understand that vacationers are not accustomed to the various species and feeding habits of our local fish. From surf fishing to crabbing, from wading the backwaters of the sound to booking your charter boat, we will go out of our way to educate the visiting traveler with the basic skills and equipment necessary to catch the finest seafood on the North Carolina coast. Nothing matters more to us than providing you with top quality service, and an unforgettable experience. Come fish with us! We will gladly steer you on the right path to catching fish on our beaches! LARGEST selection of quality, top line tackle and fresh bait!